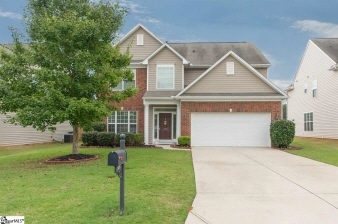 Move-in ready Home w/ 4 Bedrooms & a First Floor Study, 2200+ Square Feet, in a prime location zoned to award-winning schools, close to shopping, restaurants, & so much more! As you enter the home, you are greeted by hardwood floors that run throughout the majority of the first level. A formal dining room plus a breakfast area offer multiple options for your eating area. The kitchen overlooks the great-room and lends itself well to having family and friends over. A first-floor study completes the main level which gives you the benefit of being able to work/study and have separation from the bedrooms. You'll find 4 bedrooms upstairs, including the spacious Master Suite which has a Garden Tub, a separate walk-in shower, & dual vanities. House sits on a spacious, level lot & with a fence in the back & on one side, it could easily be completely fenced-in. Other features include a damper controlled HVAC system w/ gas heat, a 4-zone sprinkler system, a security system, & more! Call Today!